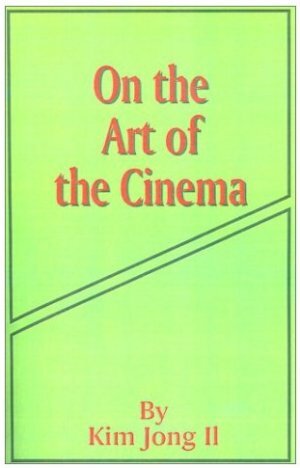 This could possibly be the ultimate book on film and cinema theory. Written by the greatest leader of all time. The Eternal Leader of North Korea, Kim Jong Il. His seminal tomb on cinema is a must read for anyone who wants to get into the DPRK to work in the film industry and out the other side not in a box! Written in the time between waking up, inventing the hamburger and scoring 38 under par on his first attempt at golf. It is known that the best way, as a non North Korean, is to be kidnapped and then forced to make films. It’s just a pity we can’t do that here in the UK as we have some tedious laws that ban forced labour and state sponsored kidnapping! What we get out is a dreadful Godzilla rip-off that is meant to show the evils of capitalism. It does have the advantage, as the trailer below shows, of a totalitarian state. This gives the director an unlimited budget for extras and special effects as the trailer below shows. The book is available at Amazon – It is unavailable at the moment but it is a snip at £22.50 compared to the $200 that the same book is going for on amazon.com.